After World War I, the population in Los Angeles County grew at a rapid rate and a regional sewerage system and infrastructure was needed to handle this growth. The Sanitation Districts of Los Angeles County were formed in 1923 when the County Sanitation District Act was adopted by the State Legislature. The Sanitation Districts' mission is to protect public health and the environment through innovative and cost-effective wastewater and solid waste management and, in doing so, convert waste into resources such as recycled water, energy, and recycled materials. Early in Los Angeles history, wastewater was managed very differently than it is today. When populations were small enough, like Los Angeles in the late 1800s, wastewater was collected in buckets and put into agricultural fields or into rivers and streams. As cities grew and medical research progressed, people began to understand the health consequences of placing their untreated waste into fields and rivers. Cities began to build sewerage systems to convey, treat and dispose of their wastewater. Because of these sanitation improvements, waterborne diseases were essentially eradicated and life expectancy has nearly doubled. In fact, the British Medical Journal asked its readers what they viewed as the greatest medical advance of the past 150 years, and readers selected improved sanitation over all other medical achievements, including the development of antibiotics and anesthesia. Today, there are two major regional wastewater treatment systems in Los Angeles County. The Sanitation Districts manage a wastewater treatment system serving about 5.6 million people in 78 of the 88 cities in Los Angeles County, plus unincorporated county areas. 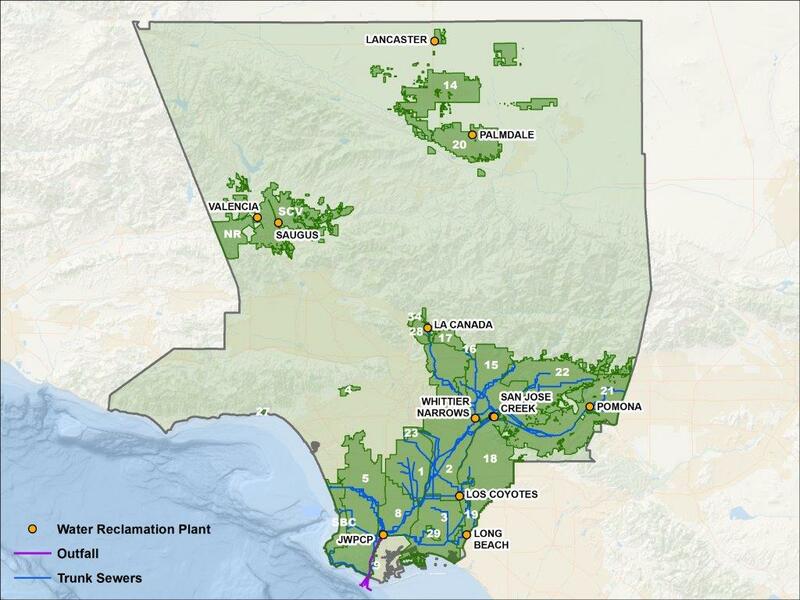 The Sanitation Districts&apos; overall system includes 11 wastewater treatment plants, 47 pumping plants, 1,410 miles of sewers, two tunnels extending from Carson to White Point on the Palos Verdes Peninsula, and four outfall pipelines that run along the ocean floor and discharge treated wastewater offshore. The portion of the Sanitation Districts system that serves the Los Angeles Basin is called the Joint Outfall System (JOS). The JOS includes 7 of the 11 treatment plants and serves 5 million people. The other major wastewater treatment system in the region is managed by the City of Los Angeles and includes the Hyperion Treatment Plant among other facilities. In keeping with our mission, the Sanitation Districts have been the nation's largest producer of recycled water over the past 50 years. In 2017, we recycled over 33 billion gallons of recycled water, which is enough water to supply the cities of Long Beach and Cerritos for an entire year. We produce recycled water that is supplied to almost 900 reuse sites and continue to look for new opportunities. The Sanitation Districts are currently involved in two large water recycling projects that are in different stages of development. For the Water Replenishment District of Southern California (WRD) project known as the Groundwater Reliability Improvement Project (GRIP), treated water from the Sanitation Districts' San Jose Creek Water Reclamation Plant will be purified to produce 10,000 acre-feet per year (AFY) of water to replenish groundwater supplies. The Sanitation Districts and Metropolitan Water District of Southern California (MWD) are also partnering on a potential Regional Recycled Water Program. This program, which is early in the planning stage, could result in a large water purification facility at the Joint Water Pollution Control Plant (JWPCP) that would produce up to 168,000 AFY of highly purified water (enough for 335,000 homes). The purified water would be used to recharge regional groundwater basins and would provide a local, sustainable, water supply. The Clearwater Project and Regional Recycled Water Program would complement each other. The Clearwater Project will provide a reliable discharge option for residual salty brine from the water purification process and will make the water purification facility less complicated, more flexible and less costly. The Regional Recycled Water Program would reduce the flows to the tunnels and thereby reduce the likelihood of inadequate capacity. The Sanitation Districts are a public agency created under state law to manage wastewater and solid waste on a regional scale. The agency consists of 24 independent special districts. Each district is a separate political entity with its own revenues, expenses and board of directors. The boards of directors are, in most cases, comprised of the mayors of each city in the District and the chair of the County Board of Supervisors (if any unincorporated county area falls within a District&apos;s boundaries). Instead of city boundaries, the Sanitation Districts were established by watershed areas to take advantage of gravity in transporting wastewater. Consequently, a city may lie in more than one Sanitation District.